You have your script, you’re working on funding and casting and you’re all set to begin production on your film or video. If you don’t have storyboards, you’re missing a critical element to both your preproduction preparation as well as every phase of your project. There are some misconceptions about storyboards though, and maybe that has been keeping you from making them. Well, check this out – here are some storyboard myths debunked! MYTH #1: To make storyboards, you need to be a great artist. FACT: Not true. While it’s wonderful if you can draw, the fact is that many folks can’t and today’s technology really helps in this regard. No need to feel embarrassed or feel like if you can’t draw that it undermines your creativity. Products on the market, like StoryBoard Quick, have made it easy to visualize your important shots and communicate ideas by assembling pre-created artwork and photos to help build your road map. Don’t let anyone insist that your storyboard needs to be the Mona Lisa otherwise your idea will get lost. You can create amazing storyboards, even if you can’t draw. MYTH #2: You need a huge budget in order to afford storyboards. FACT: If you pay a story artist to draw your boards and pay for multiple revisions, it will cost you a pretty penny. But as a director, producer or writer, you don’t need to have a huge budget to build that visual blueprint you need yourself. Of course, along with fast and easy storyboarding software, you’re better served by being resourceful and assembling images. After all, when you hand a script over to a story artist, you’re going to get back THEIR vision of YOUR story (what THEY see in THEIR head). 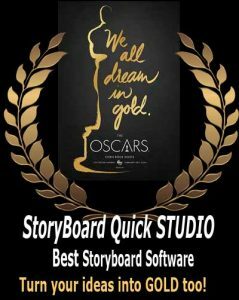 You want to keep control over that vision for as long as you can so affordable storyboard software like StoryBoard Artist (which can serve you time and time again) is going to pay off bigger dividend in both the short term and long run.